We’ve just prepared a little white paper on the benefits of High Frontier for STEM (Science Technology, Engineering, and Math) education. There are substantially more and better paying jobs in STEM fields than in non-STEM fields, but only about a fourth of high school freshmen express any interest in STEM fields, and half of those change their minds by the time they graduate. What kids do have an interest in, though, is video games: 97% of teenagers in the U.S. play them. So, this is a great fit — a video game that’s fun to play, and, by the way, also happens to have you doing real engineering and problem-solving in a high-tech area. Read the paper for more! And then please, go support our KickStarter campaign! 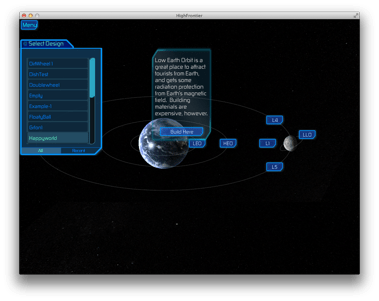 We’ve been hard at work on the internal colony management prototype for High Frontier. The video below does a quick recap of building (as of version 0.09), and then we switch to the internal view, and show off a couple of new features. 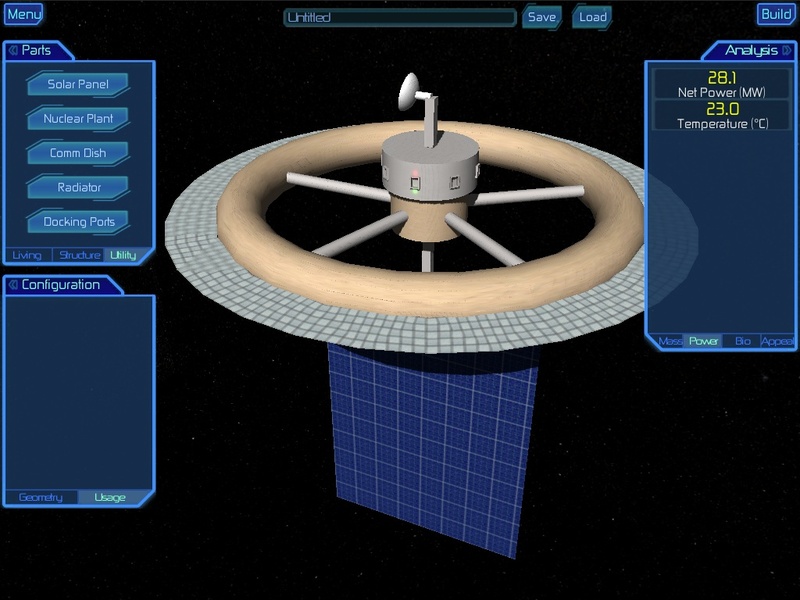 We’ve just released version 0.09 of High Frontier, the space settlement simulation game! We’ve just released version 0.08 of High Frontier, which adds a bunch of new parts for your colony: solar panels, power plant, radiators (including “skirt” style), docking bay, and communications dish. These are currently cosmetic, but will start impacting the simulation soon. Version 0.06 of High Frontier is out today! Here’s a little video demonstrating the new rotational dynamics. It’s been a long few weeks. 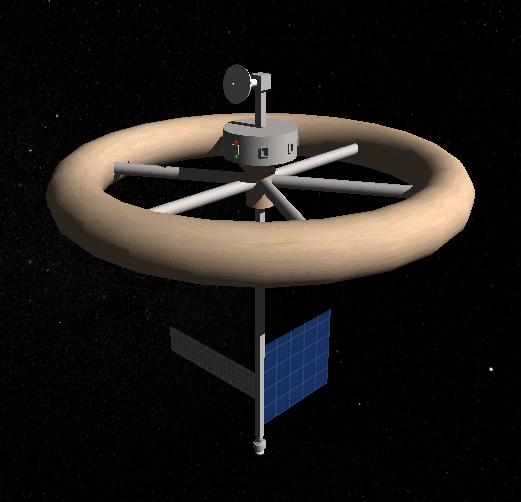 In 2007, I worked with the original designers of the Kalpana One orbital settlement to revise the design for rotational stability. To recap, you can measure how much rotational inertia an object has around any axis, but in the case of a space colony, what really matters is how the intended spin axis compares to a “sideways” axis. The standard rule of thumb is that the inertia around the spin axis should be at least 20% greater than the inertia around any other axis. Otherwise, your space colony could start tumbling end-over-end, and your colonists will be justifiably upset. The best case, in terms of stability, would be flat endcaps; anything else is going to move more mass away from the X and Y axes, while not moving any further away from the Z axis, and thus make stability worse (except perhaps concave endcaps, which may make sense but are not considered here). But we’ve now spent the last couple of weeks building up High Frontier’s dynamic simulation, including calculation of rotational inertia. So it’s time to consider those inverted endcaps.